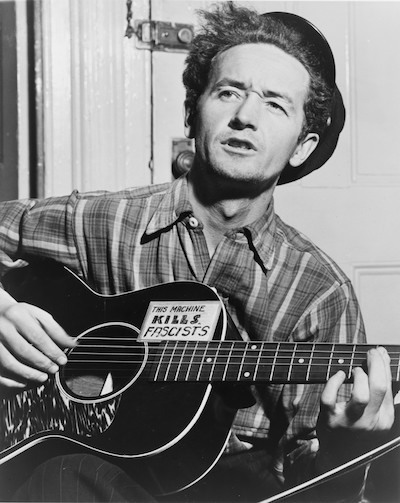 Woody Guthrie was one of the most important folk musicians of the 20th Century. His work has inspired countless other artists, including Bob Dylan and Bruce Springsteen. In the early 1920s, two Italian immigrants, Ferdinando Nicola Sacco and Bartolemeo Vanzetti, were accused of murder, convicted, and executed. Both men were admired anarchists and the trial was widely considered to be politically motivated. In 1947, Woody Guthrie released Ballads of Sacco and Vanzetti, an album that explored the life and trial of the two anarchists. "Two Good Men" is the seventh song on that album. Two good men a long time gone, Two good men a long time gone (Two good men a long time gone, oh, gone), Sacco, Vanzetti a long time gone, Left me here to sing this song. Say, there, did you hear the news? Sacco worked at trimming shoes; Vanzetti was a peddling man, Pushed his fish cart with his hands. Sacco was born across the sea Somewhere over in Italy; Vanzetti was born of parents fine, Drank the best Italian wine. Sacco sailed the sea one day, Landed up in Boston Bay; Vanzetti sailed the ocean blue, Landed up in Boston, too. Sacco's wife three children had, Sacco was a family man; Vanzetti was a dreaming man, His book was always in his hand. Sacco earned his bread and butter Being the factory's best shoe cutter; Vanzetti spoke both day and night, Told the workers how to fight. I'll tell you if you ask me 'Bout this payroll robbery; Two clerks was killed by the shoe factory On the street in South Braintree. Judge Thayer told his friends around He would cut the radicals down; Anarchist bastards was the name Judge Thayer called these two good men. I'll tell you the prosecutors' names, Katsman, Adams, Williams, Kane; The judge and lawyers strutted down, They done more tricks than circus clowns. Vanzetti docked here in 1908; He slept along the dirty streets, He told the workers “Organize” And on the electric chair he dies. All you people ought to be like me, And work like Sacco and Vanzetti; And every day find some ways to fight On the union side for workers' rights. I've got no time to tell this tale, The dicks and bulls are on my trail; But I'll remember these two good men That died to show me how to live. All you people in Suassos Lane Sing this song and sing it plain. All you folks that's coming along, Jump in with me, and sing this song.